Hot today! We put on the sun protection cream and all the jackets came off. It was hot in the mess coach; we flung the doors open. Soon it will move back to Winchcombe from whence it came. 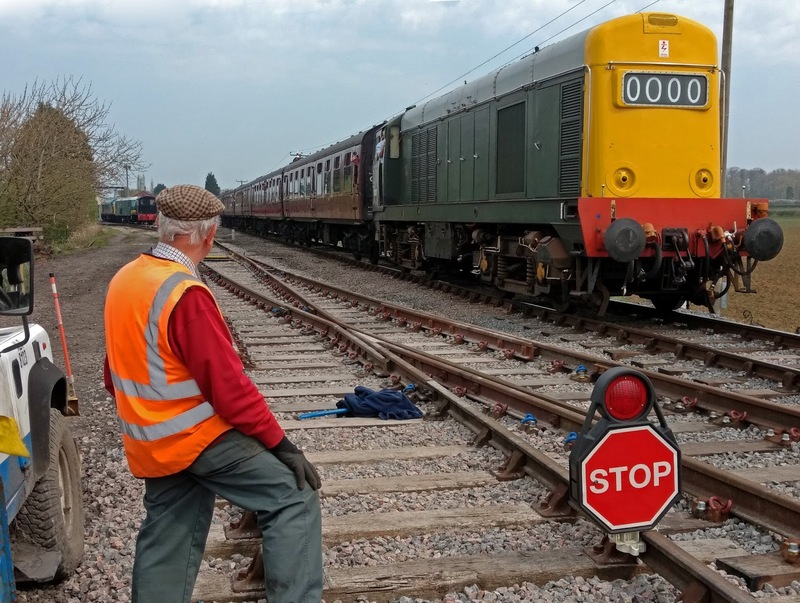 It was (perhaps) our last day at Toddington. Outside in the morning sun Foremarke Hall was having her back scrubbed. Normally you see this only in the zoo, in the elephant house. The Green Goddess stuck her nose out of the shed door to see what the sunshine was like. Such an immaculate machine in a beautiful deep (British racing?) green. Love the 'Ferret & Dartboard' logo on the side too. 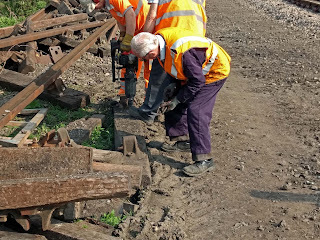 On this hot day we decided to Kango pack the main line point at Toddington south, and clean up the site, in particular of its many chaired up sleepers that had been thrown to one side after stripping out lengths of plain track for the two new turnouts. BTW, we heard that they are expected to enter service in October, there still being quite some S&T work to be done on them, including the fitting of sole plates and two point motors, which will be interlinked. An early shovelling session, while it was still cool, took us to one of the yard turnouts where this interesting arrangement of very old chairs was found. Note that the two chairs are triangular (presumably this allows two of them to be fitted in an area with little space) which is very unusual. You can probably make out the 'GWR' on this end of the lower one. The other, sharp end was dated 1883! To top it off, an antique oak key can be seen securing the rail to the chair. This was once how all rails were secured to chairs, and today such keys are made of steel (to varying designs). 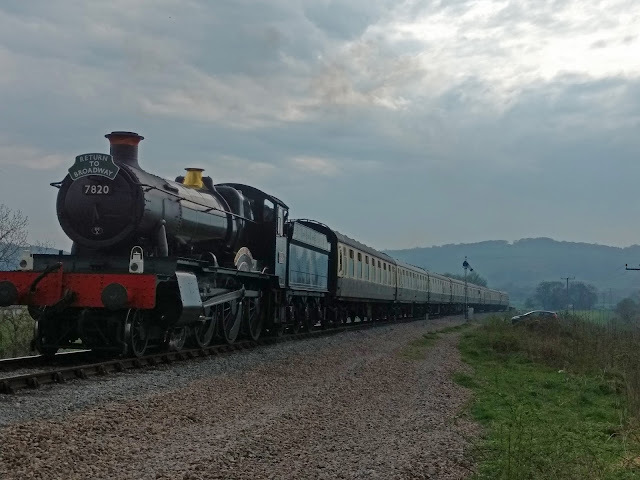 We stopped to let the early morning steam departure for CRC go by. Diana and Mike look on, after acknowledging the whistle. Dinmore was in charge again. The sleepers being in a big bundle of 'Pick up Sticks' we dragged some of them out with nips, but others were upside down and the chairs, now underneath, prevented any dragging even by the strongest among us. 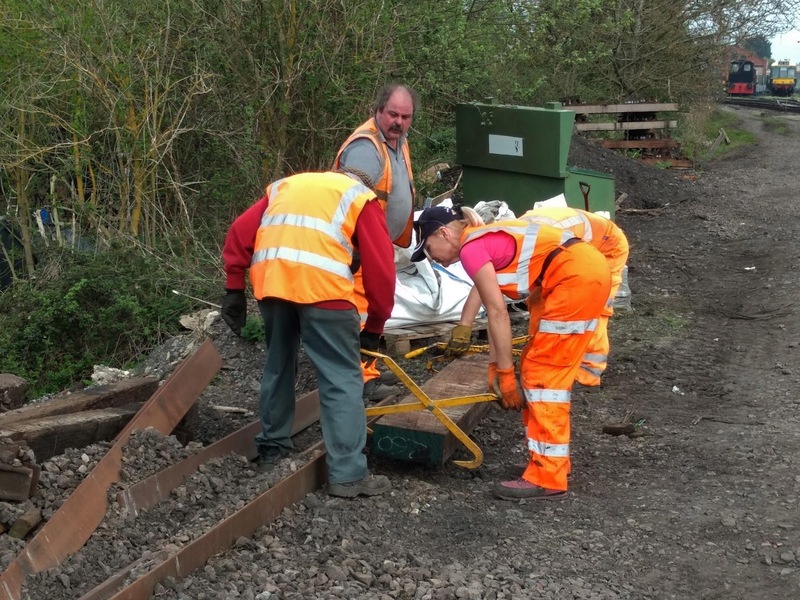 Here Mike and stalwart Steve (who joined in March 1981 he told us) roll over one of the sleepers, so that the 'Animal' can be used to loosen the chairs. Meanwhile others still had youthful playfulness within them, and they can be seen here engaged in a game of 'cat's cradle' (remember that from the school playground?) with a totally jumbled up extension lead for the Kangos. To protect the two men busy packing the main line turnout with Kango hammers we had Graham on lookout, and John, wearing an impressively determined look, was posted by the genny. The Kango hammers are noisy and the best way of alerting the users is to cut the juice! 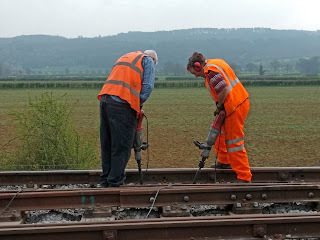 Out on the main line we had Neil and Steve L, our two strongest gangers (although by no means the youngest) working the electric Kango hammers under the crossing, where some extra consolidation was required (after observing trains going over it). Behind them, the Cotswolds Edge. Graham watched over them, ready to wave the yellow (or even the red) flag at a moment's notice. 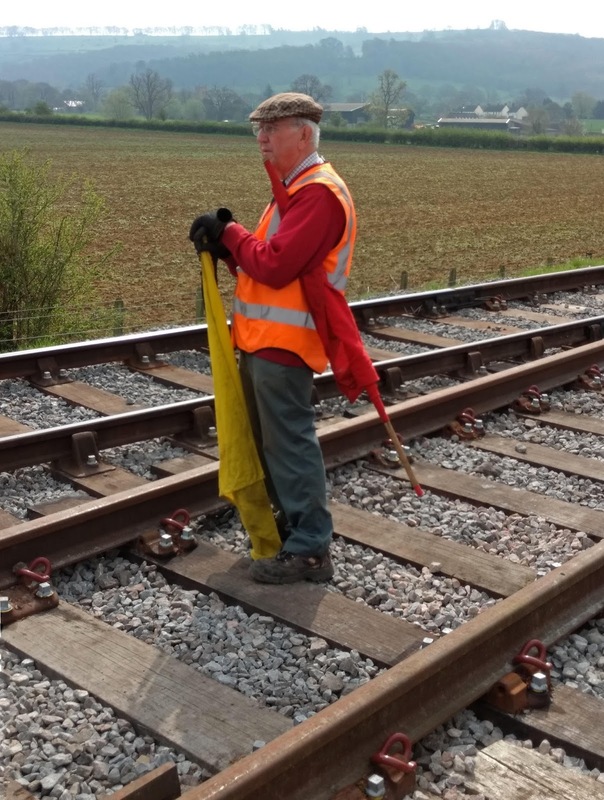 Unfortunately the rattle of the signal betrayed the arrival of the passing train, John cut the genny and Neil and Steve L hurriedly vacated the scene, leaving Graham with nothing to wave the flag for. Here it comes. 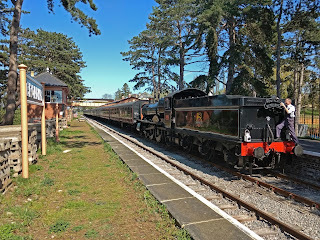 It's diesel hauled, with a pink timetable this part of the season and thus one steam and one diesel hauled train out and about today. Bit by bit we cleared those sleepers. They were walked to their respective piles by teams of four on two nips. The cast iron chairs were put on pallets, and we mulled over the idea of a clear up train, which would allow us to take all this back to Winchcombe in one go. We didn't have Stevie today (not enough work for him, but also the absence of doughnuts this morning could explain his non-arrival) so the rails where they blocked the removal of sleepers had to be moved by hand. 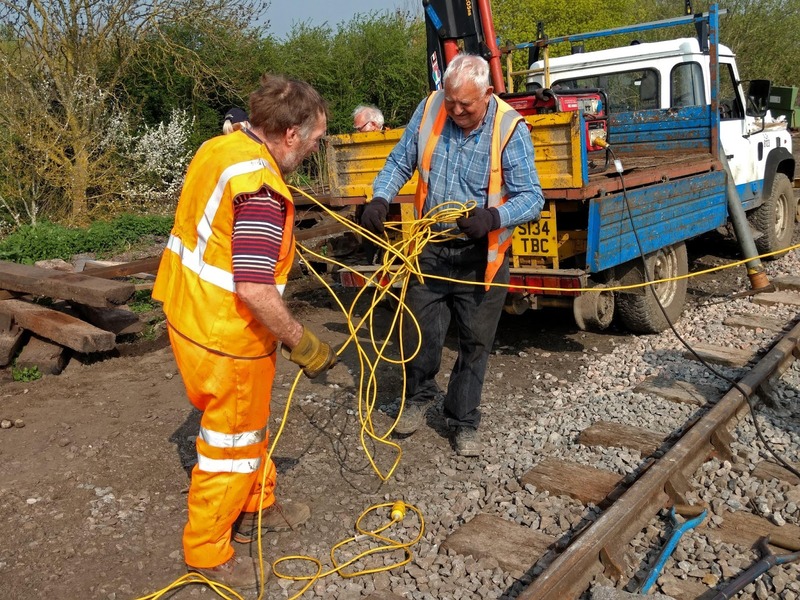 Here one is being jacked up to allow the removal of the trapped sleeper underneath. Following a request from the NGR chaps we took three loads of second hand sleepers down to them. They saw them in half and make twice as many. 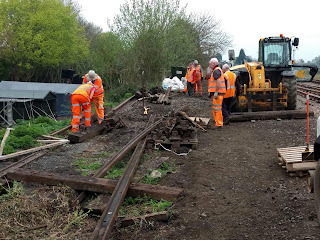 At the end of the day the site had almost no sleepers left on it. Loose rails still need picking up, and the stacked chairs on pallets need taking to Winchcombe. After a hot start to the day, it clouded over at lunch time and a short but heavy shower caught those that left the mess coach early for more punishment. The rest of the day looked rather gloomy, as you can see in this picture of Dinmore returning from CRC. At the end of the day pretty much the whole gang decided to treat itself to an 'on the cushions' ride to Broadway and back. We can highly recommend the 'Return to Broadway' ale, made by a local brewery with our own label of the Cornishman racing through the station. Do give it a try. 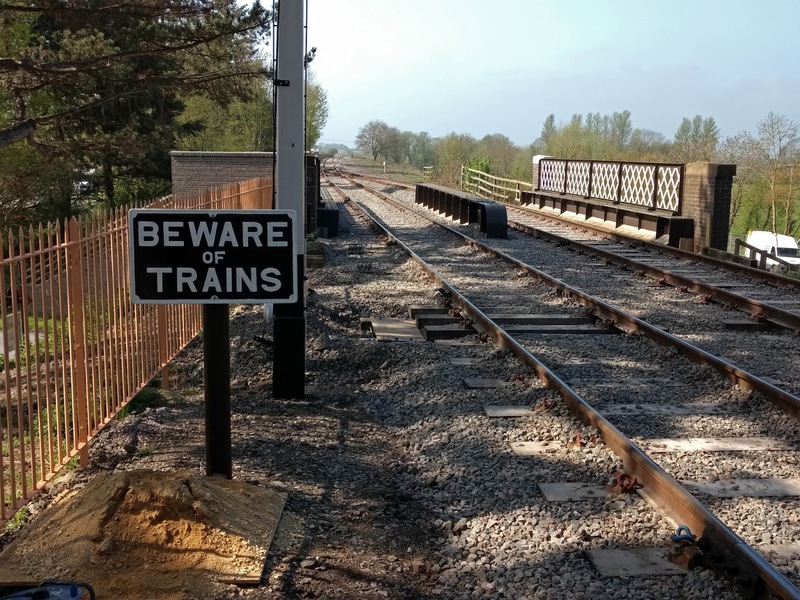 Friday saw the erection of the first of the replica GWR 'BEWARE of TRAINS' cast iron signs. They were sponsored by two volunteers to recreate the heritage look. We hope you approve. 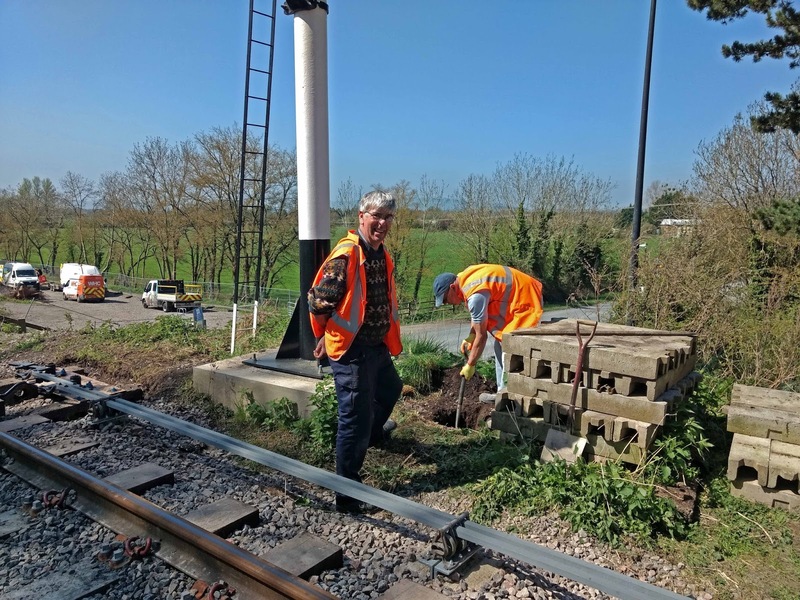 While the trackbed was still bare bullhead rail posts were dropped off some months ago at the 4 corners of the platforms. Here Neal is drilling one so that the cast iron notice, not yet painted, can be bolted to it in due course. A first post was already in situ on the end of P1, so we set out to dig in the second on the end of P2. The warning notices accompany the barrow crossing that will go in here. We dropped the post into its new hole, and filled the hole with concrete. As this went off, we returned to P1. Here is the first cast iron notice in place. Looking good, more GWR atmosphere here now. Now to wait for a GWR engine to appear. We have had these notices specially cast from an original purchased from a kind supporter. They are the real deal, very heavy. We would consider casting more, if the demand is there. 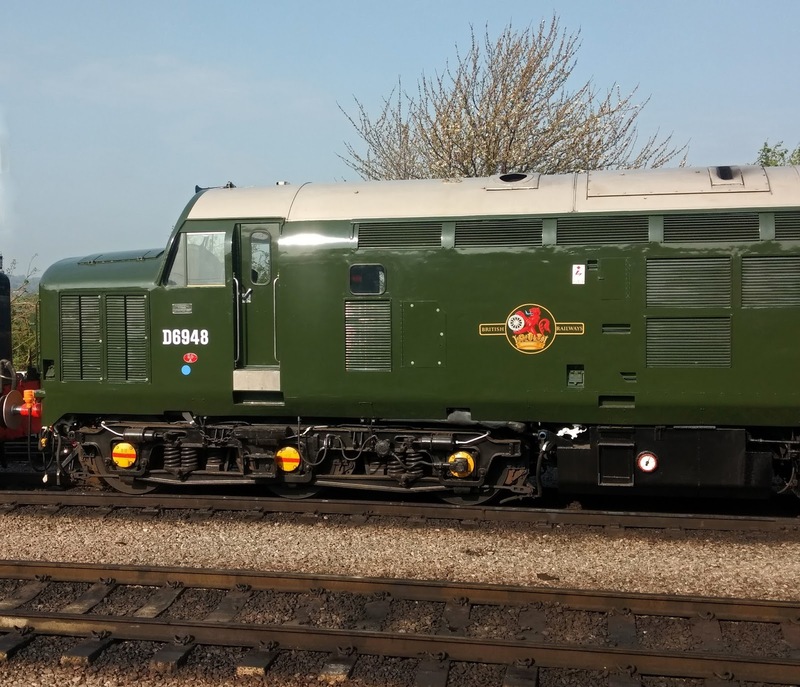 CRC also purchased 4 and if you or your railway are interested, drop us a line at breva2011 (at) hotmail.co.uk. 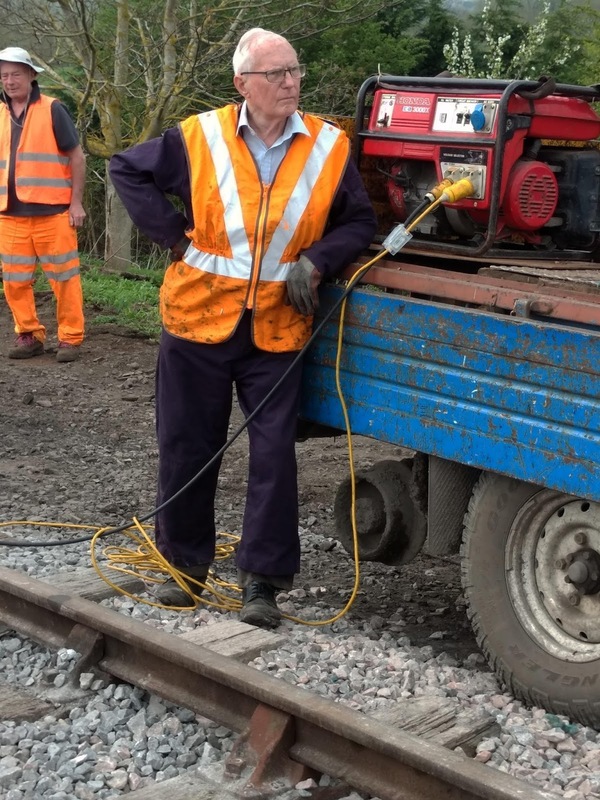 Any profits go to the railway and may be spent on further heritage material. 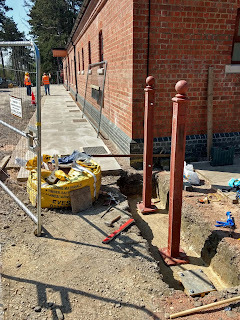 Elsewhere on site on Friday two replica GWR gate posts were being erected at the northern end of the station building. This was the original entrance to the station, but as we have opted for two doors in the booking hall, this will now become a side gate. 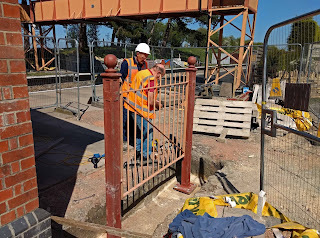 In the picture below you can see how people queued up to use this gate to get on to the platform and access the booking office from its sole, platform side door. Note how the queue stretches right down to the bottom of the station approach. 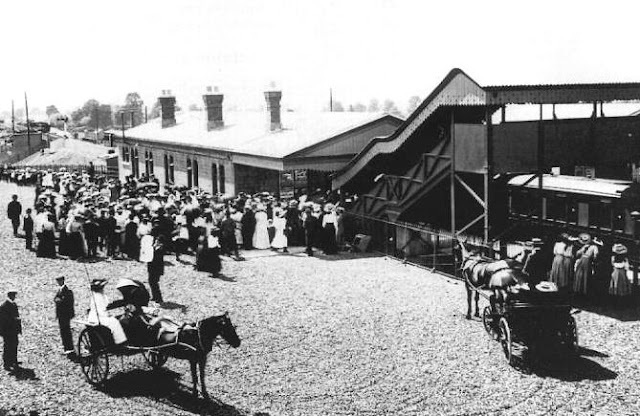 The train waiting in the station, in 1904 still the terminus for the first 5 miles built, will take them on an excursion to Stratford on Avon, on the second day of operation. 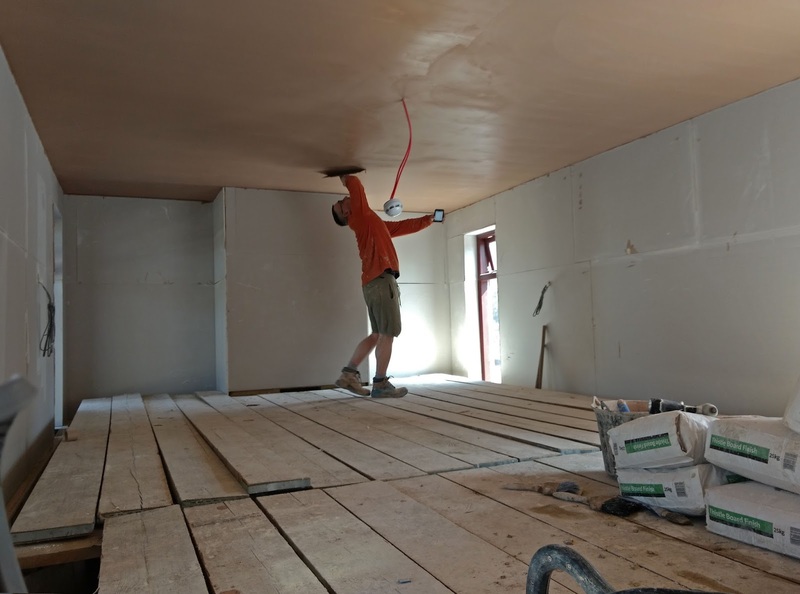 Professional plasterers have been at Broadway for the last few days. 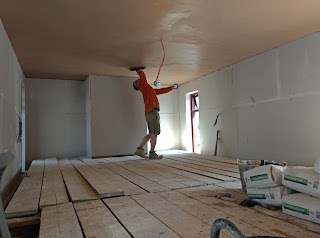 In this picture they have plasterboarded the walls of the cafe, and are skimming the ceiling. Soon we will be able to remove the scaffolding for good, and the full size of the cafe will become visible. (very similar to the Coffeepot at Winchcombe in fact). During the day we received two visits from Dinmore and a rake of 8. Friday may be a non-running day, but that is only as far as the public is concerned. Engineering trains can arrive at any time for example. 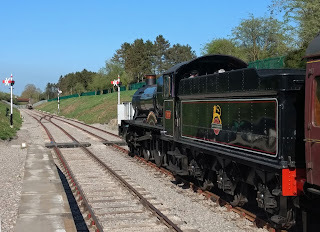 Here is a shot of Dinmore come to rest at the end of platform 1. It looks as if the rails stretch on all the way to Honeybourne, the future maintenance containers are almost hidden. One of the carriages was filled with candidates and their supporters, and the bar was open. That sounds like a good innitiative. The hungry cast iron notice fitters received a left over Danish pastry, which went down extremely well ! Love the photo of the Plasterer - trowel in one hand, phone in the other! Where have all the Refresh. room windows gone? Yes, I know that it is easier to board over them and cut the apertures out later. Does look odd though! We love the whole station with its meticulous period atmosphere and fittings. Can't wait for our visit. Thank you for saying so, it makes it all worthwhile going into the historical detail. Fascinating to see those 19th century chairs, still giving good service. My first thought was to suggest putting them on display somewhere as museum pieces, but it's rather nice to that they're still doing the job they were made to do. On a slightly-related note, recently I spotted some lengthy sections of broad gauge Barlow rail in use to beef up a culvert headwall, on the west side of the line just south of the Childwickham Road bridge (there's a footpath alongside the line here). Barlow rail was a short-lived type of rail with a very wide base. The idea was that it would sit on ballast without the need for timbers. It wasn't a success - it was quickly discovered that timbers were needed after all. 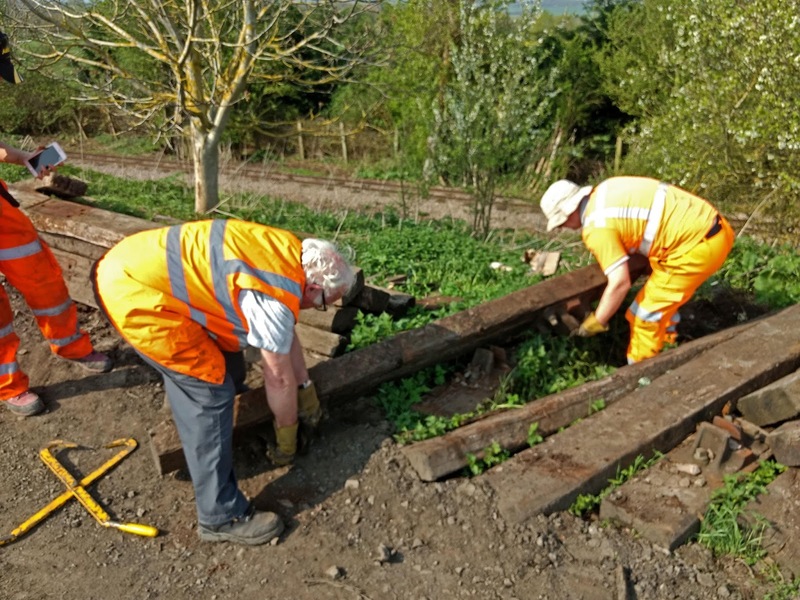 The GWR decided to standardise on Brunel's 'bridge rail' - the more familiar type of broad gauge rail which can be seen used as fence posts along the Honeybourne line. Barlow rails were recycled, chiefly to make retaining walls. 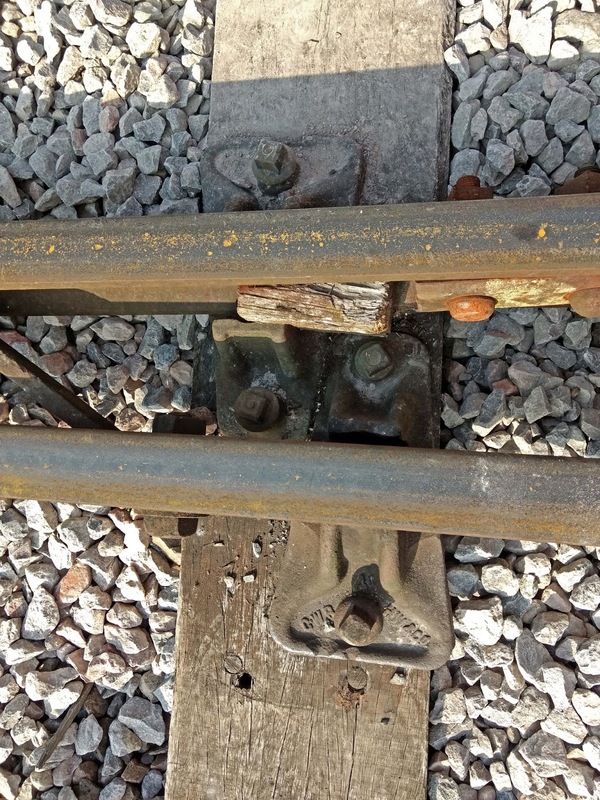 Some bits of Barlow rail can be seen used in this way at Slough station. 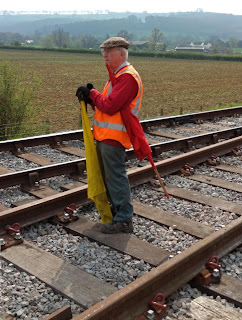 What makes the rails at Childswickham unusual is that they're very long - quite possibly the longest sections of Barlow rail that now exist. 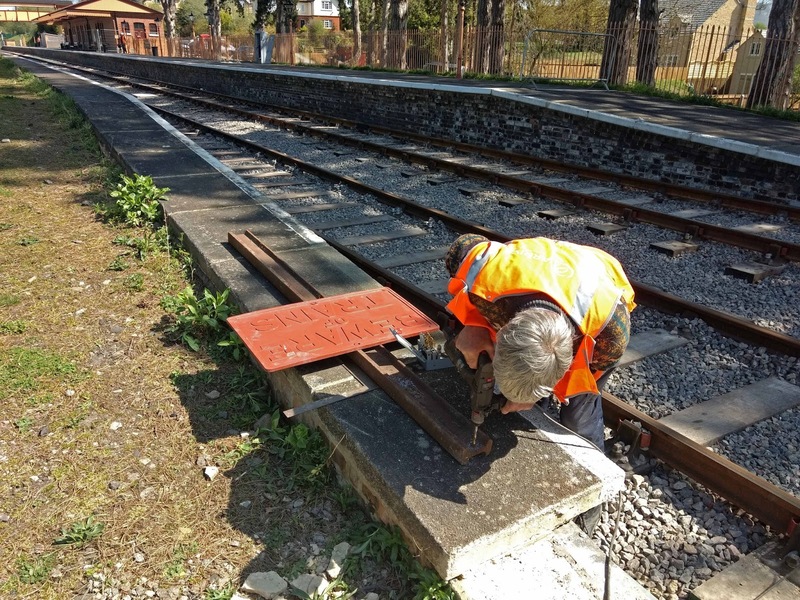 As such those rails are incredibly rare artifacts. 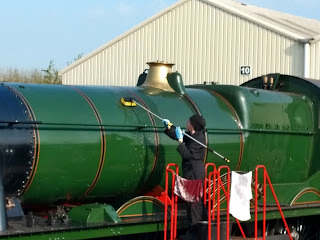 I don't believe even the Great Western Society at Didcot (which has a broad gauge running line) has any Barlow rail. 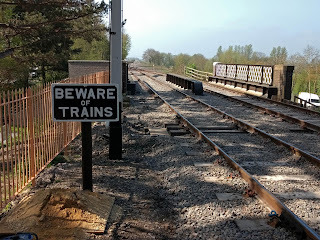 There's a short length of Barlow track on display at Ross on Wye, but this shows the rails laid on timbers, not in ballast, as was the original intention. I think I know the ones you mean but we won't be taking those down any time soon as they are doing a vital job on a tricky slope there. In fact we took off some of the ash that had built up behind it when regrading that slope. 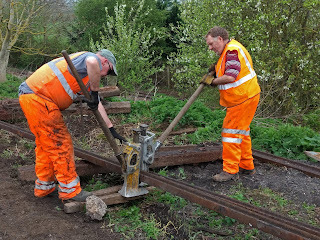 There is also an area of Barlow rail on the Shipston tramway at Longdon Road. I am quite struck with that picture from 1904. The train is in the station, with ladies on the right peering over the fence. Two men talking to one another close the horse drawn carriage..
Then a crowd of people, milling around the back of the Station, with a queue all the way down to the road, at the bottom. 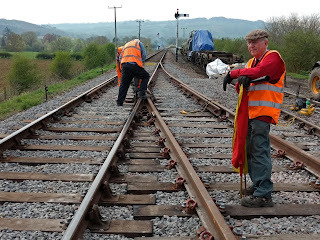 1904, a time when the railway only went north to Stratford on Avon, whereas now in 2018, the railway only goes south to Cheltenham Race Course. Jo, can an original print of that picture be bought from any where that you know? It's quite a well known picture, one of two taken one after the other on that occasion, the day after opening. Strangely though no one I know has a good quality scan of it. The biggest I have is about 500kb. If anyone has a better one, I'd love to have a copy. There is indeed a lot to see. Note the station has three chimneys, and our current much larger one was only designed with two. 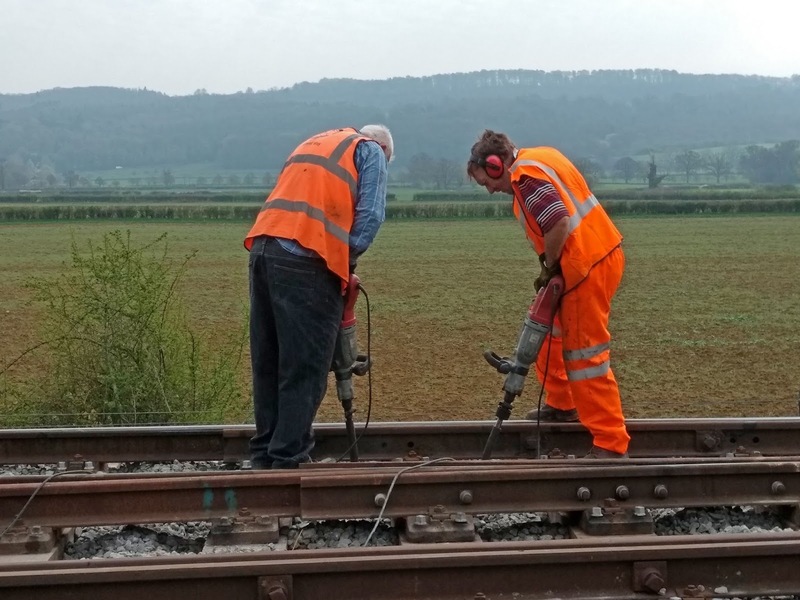 In the far distance is a contractor's train (continuing the build towards Toddington) and one can also make out huts in the future car park field. The goods shed is not up yet, nor is the signal box. 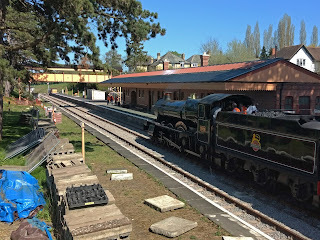 Services started with a temporary one at the northern end of P2. From another picture (recently in the Cornishman) you can see that the stationmaster's house was erected after the station, so here the photographer would have stood on a tump, rather than in the window of the future house. Two other 1904 (or thereabouts) pictures were taken in the other direction, standing on P2. The coming of a railway station was quite a thing in 1904, and most of Broadway seems to have come out to see it. Wouldn’t it be nice to have replica coaches like the 1904 ones, but made to meet safety standards! RE: "In the far distance is a contractor's train (continuing the build towards Toddington) and one can also make out huts in the future car park field. 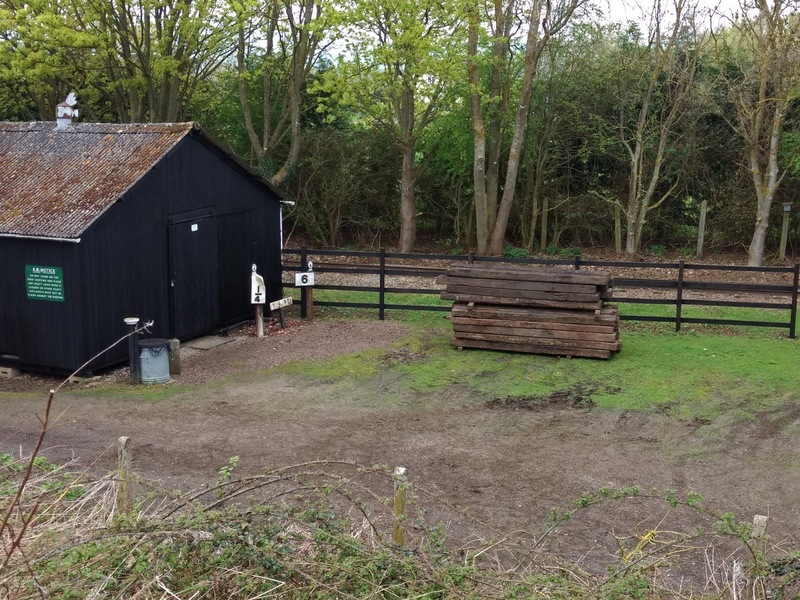 The goods shed is not up yet, nor is the signal box. Services started with a temporary one at the northern end of P2." Thank you for pointing out those finer details to that picture. It captures a moment in time, on a day in 1904, one of celebration of the opening of Broadway Railway Station. Then 114 years later Broadway Station opens again. It still is all quite unbelievable and now stands as a 'monument' to a truly unselfish, herculean effort in Railway restoration. Couldn't agree more with Mark's comments. What would be fascinating would be a blog showing before and after shots of the station. If that could be achievable Jo? Good name for a pub, the 'Ferret and Dartboard' ? Many thanks from the NGR for the secondhand sleepers. 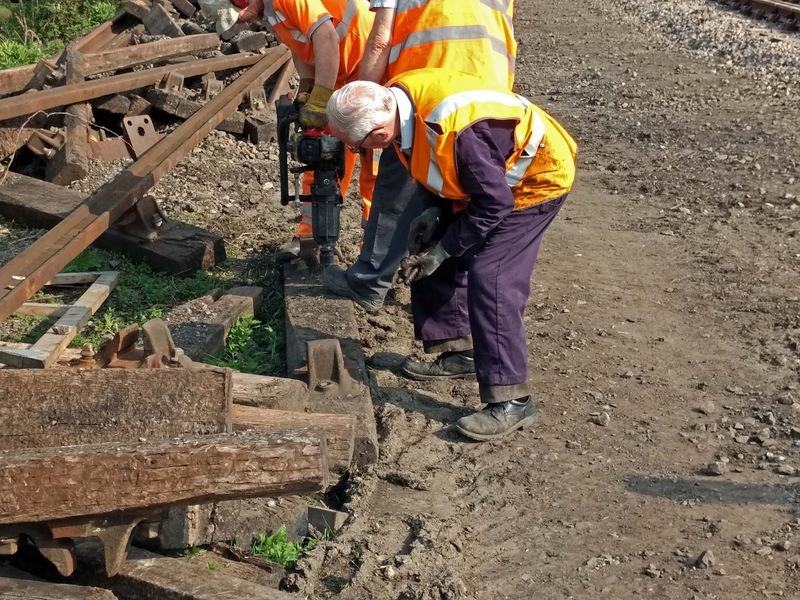 We have sawn them in half and they are now stacked and ready for next winter's resleepering programme. Hmmm, now there's an idea. Possibly tree growth would prevent this. Maybe wait until the footbridge steps are up, we hope later this year. Wow! If the steps go up, even with most of platform 2 cordoned off it will provide great photo opportunities from the bridge. In fact, can someone “official” get up on the bridge even now by ladder and get some video or photo of the trains?